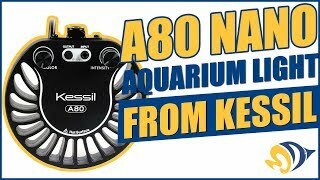 The new Kessil A80 LED fixture is an ultra-compact, completely silent, LED fixture that is great for Nano Reef Aquariums and Fish-Only Aquariums. Kessil`s unique, efficient Dense Matrix LED array is built in-house and packs high-power and deep penetration onto a single small chip. Utilizing Kessil`s carefully designed optics and the Dense Matrix array, the A80 provides the most light per watt of any fixture built so far. Use the dials on the fixture to quickly set the spectrum and intensity for a personalized look or use your favorite 0-10V controller. Kessil Logic™ maintains consistent output no matter the spectrum. Daisy-chain multiple lights (with Link Cable, sold separately) for seamless control from a single source. Or, use the Kessil Spectral Controller (sold separately) for advanced programming and automated control. None as far as I am concerned! 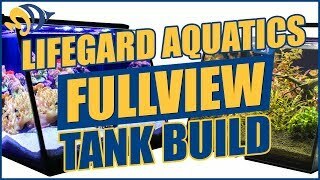 I highly recommend this light for anyone looking for a simple, reasonably priced, and quality fixture for 5-10 gallon reef tanks. I have it over my 5.5 gallon reef tank and could not be happier with it. The fact there is not fan means this light is 100% silent. The passive cooling works wonderfully and even when light is on for 10+ hours, it is simply warm as opposed to hot to the touch. The adjustable knobs for intensity and color are wonderful and make subtle changes perfectly. It is also quite compact and takes up, relatively, very little space. LPS corals love it. I own two now. This has been a great little light for the past year over my nuvo 10. It has been growing my lps pretty well. However, I've made the dive into sps and decided to upgrade my light to the ai prime hd because I was worried this wouldn't supply enough power. Lights up the tank nicely. Corals are growing very well with this light. It works so well on the fluval evo 13.5. No corals yet, but the quality is great and the look is very clean over IM10. Hoping to keep softies and LPS. The shimmer, spectrums, brightness, price point, and sleek design. Only one mount option available.